It's time to get HYPER! 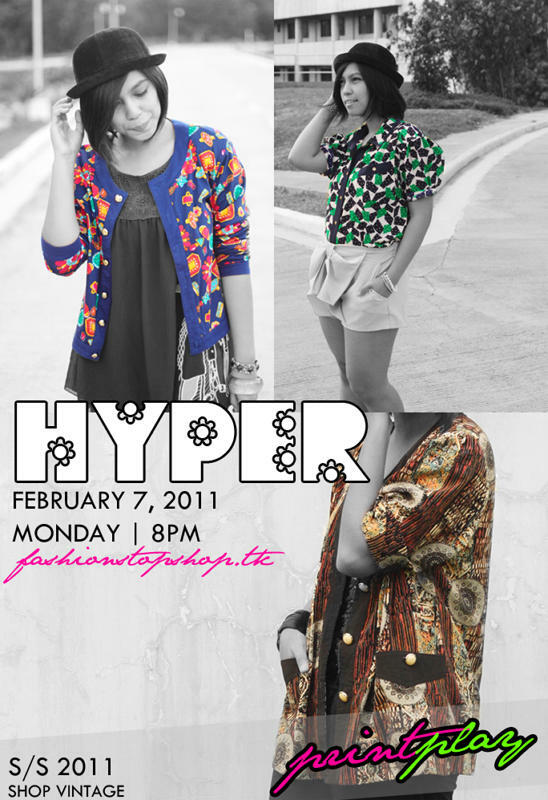 The S/S 2011 trend reports have inspired F-STOP to scour thrift shops for clothes in full colors and vibrant prints. If one of your fashion resolutions is injecting color to your wardrobe, then this collection might have something for you. Expect the usual client favorites like blazers, tunics, dresses. You're guaranteed this season's hottest: floral prints, laces and sheer! This love month, F-STOP hopes to play cupid and make you guys fall in love with its latest offer. Showing some blogger (and schoolmate) love for Melai of Style and Soul as she starts the year right with a collection that's set to make your vintage-loving heart all a-flutter. So, remember to save the date: February 7, Monday, 8PM. I have my thoughts to keep me company. And maybe the rest of the world too. All photos in this blog are owned by LIANE REYES unless otherwise noted. If you want to use them, attribute please. Header by LESTER PASCUA.